With more than 150 credits that range from “Buffy The Vampire Slayer” to “No Country For Old Men” and, perhaps most memorably, his iconic role in “Office Space” and his long-term TV work on “NewsRadio” and “King of the Hill,” Root is a character actor of character actors. While many might not know him by name, his face is as recognizable as a Hollywood star’s. Aiding and abetting that ubiquity: Root has five films in the first five months of 2011 alone. First there was “Cedar Rapids,” then the animated “Rango,” and Kevin Smith’s “Red State,” which is about to wrap its pre-release tour. Still to come are Robert Redford’s “The Conspirator” (which opens this Friday), and “Everything Must Go,” which screens at Tribeca and hits theaters in May. Root talks to indieWIRE about being the man who can do anything and his 1,000th IMDB credit. Thanks for taking the time to talk with us. I’m unemployed, so no problem. Really? Looking at your IMDB page right now, I find that hard to believe. Well, you have a slew of films that have just come out, or are about to come out: “Everything Must Go,” “Rango,” “Red State,” “Cedar Rapids,” “The Conspirator.” Want to somehow summarize your 2011-specific resume in 100 words or less? It started out this year with the release of “Cedar Rapids,” the Ed Helms film. That was at Sundance, and so was Kevin Smith’s “Red State” and Robert Redford’s “The Conspirator,” so that got things going. And then there was “Rango,” which I did voice work on and that just came out. And “Everything Must Go” is going to screen at Tribeca and come out in May. It’s been a whirlwind few months. Did you attend any of the “Red State” sneak preview tour screenings that Kevin Smith just had across the country? Absolutely. The kickoff at Radio City Music Hall was just astonishing, standing on that stage was like standing on a football field. A lot of the cast showed up, including John Goodman, and Melissa Leo, who had just won an Oscar. It was really great. And I also caught the tour in New Orleans. It was rock-and-roll in there, too. The interesting thing with those screenings is that there was so much cheering going on when the main villains get killed. I never expected that. You’re also currently filming Clint Eastwood’s “J. Edgar,” where you play Arthur Koehler. Talk a little about what that’s been like. I’ve actually just finished filming and I think they’re just about to finish up altogether. I mean, it was great in so many ways. I got to work with my friend Dermot Mulroney. And then of course, there was Clint and Leo. “Edgar” is your 156th credit on your imdb page. That’s if you just count “NewsRadio” and “King of The Hill” as one. True. Or those nine episodes of “The West Wing” and four episodes of “True Blood.” So let’s round off and call it your 1,000th credit, then. Of all of them, what character do you get recognized the most for? Oh, it’s definitely “Office Space.” I mean, it frightens me that it’s definitely “Office Space.” I don’t think I look like that character at all. But that film… the underbelly of America just continues to discover it over and over again. 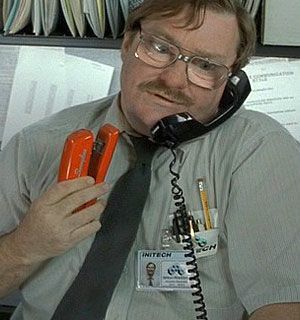 Do you get lots of staplers? I get at least two staplers a week! I’m not kidding. Sometimes more, depending what the mail’s like. And just recently on the set of [FX series] “Justified,” the whole crew came up to me after we finished shooting one day with staplers. What’s the weirdest experience you’ve ever had on a film set? I can’t really think of something off the top of the head. But it really astonishes me in general that wherever I see to go, like when I take a personal trip to New York or something, people will actually recognize me. I’ll come down from the hotel and there’s people with “Dodgeball” or “Office Space” posters or whatever. It really blows my mind. I don’t know how they know I’m there, or how they even know who I am. It’s a really a interesting level of celebrity you have, given that that one on hand you’re this character actor, and on the other, you’ve played all these iconic roles. Exactly. And it’s all these different kind of people and different generations.. you get a sporty crowd with “Dodgeball,” while “Office Space” often bring this younger crowd, “NewsRadio” another generation, “King of the Hill,” “No Country For Old Men.” It’s a diverse group of fans. I mean, it’s great, but it’s just always so unexpected to me. What’s been a really challenging part of your career so far? It’s been challenging to be able to manage it all. When you film so many TV comedy roles – especially like I did in the ’90s, with “NewsRadio” and “Seinfeld” or whatever, you get typecast and it was really difficult to break out out that. And in 2000 or so, I really decided to try and do that. But to be able to change casting directors minds was hard, especially with dramatic roles. But I kept pushing, and it eventually paid off a bit. It must have helped that folks like George Clooney and the Coen Bros. have clearly taken to you. I was such a huge Coen Bros. fan! I loved them. And when I got to work with them, it was just fantastic. And then to have them cast me again… it was an honor. And George is always fantastic. I love working with him. Of all your characters, do you have a favorite? Or is it that even possible? For the fans, it’s “Office Space”. But I just had a memorable time doing 13 years on “King of the Hill.” I played so many different characters on that show. Six regular ones, but countless other ones here and there. That gig was truly a character actor’s dream. I have to say my favorite is Jimmy on “NewsRadio.” I’ve seen every episode of that show like 10 times. I appreciate that. I really do. “NewsRadio” was such an incredible experience. It was so great to go to work every day and work those people, Phil [Hartman] and everybody else. And we never knew if we we’re going to get picked up each year, but we still didn’t care what numbers the show got. Because we got to do all the bizarre, twisty things we wanted to do. What’s next? Is there anyone left that you want to work with? Working with Eastwood and Redford in one calendar year was amazing for me. And at this point in my career, being able to choose a bit about who you want you to work with is such an accomplishment in itself. It’s a nice position to be in. Hopefully, it will continue.